Combination of battery-protected and surge-only outlets reserves power capacity for connected equipment that requires battery back-up. Dataline Surge Protection provides protection of connected equipment on the data lines. 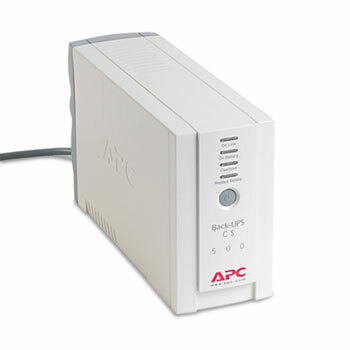 Power conditioning protects connected loads from surges, spikes, lightning, and other disturbances. Audible alarms delivers notification of changing utility power and UPS conditions. Automatic restart of loads after UPS shutdown upon the return of utility power for exceptional convenience. Automatic battery self-test ensures early detection of a battery that needs to be replaced. LED status indicators helps you to quickly and easily understand UPS status. Battery replacement without tools for reduced risk of load disruption. Transformer-block spaced outlets keeps equipment secure without blocking access to other receptacles. Resettable circuit breakers enables quick recovery from UPS overload events.